The Security Center is the eBay area that focuses on protecting eBay buyers and sellers from members who aren’t playing by the rules. Through this department, eBay issues warnings and policy changes — and in some cases, it gives eBay bad guys the heave-ho. 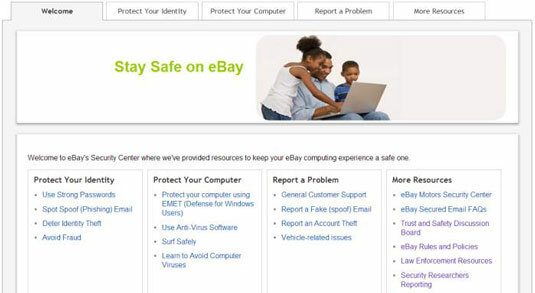 Security Center: You reach the Security Center from a small link found at the bottom of almost every eBay page. From here you can find and report safety violations. Resolution Center: Find this link from the Legal & More tab at the bottom of the eBay home page; just put your cursor over the Customer Support link and choose Resolution Center from the drop-down menu. This is where you report transactional issues: unpaid items, items received not as described, and more. The Security Center is more than just a link to policies and information. You get the latest tips on staying safe on the Internet. It also connects you with a group of eBay staffers who handle complaints, field incoming tips about possible infractions, and dole out warnings and suspensions. Keep in mind that eBay is a widely varied community of people, most of whom have never met each other. No matter what you buy or sell on eBay, don’t expect eBay transactions to be any easier than buying or selling from a complete stranger. Whatever the personality of the seller, know your purchase is covered by eBay’s Buyer Protection.